Postie MateTM is the UK Registered Design No. 4044792 Personal Protection Device (“PPD”) which enables the safe delivery of leaflets, mail and A5 size magazines through letterboxes. A Patent is pending. The items to be delivered land flat unfolded, in pristine condition – even through two sets of letterbox draught excluder bristles - making their intended impact within a few seconds of viewing. 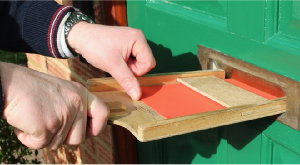 Postie MateTM can speed up leaflet delivery, as compared with delivery solely by hand, by up to 50%. 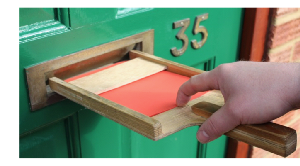 By taking away the need to put hands through a letterbox to deliver items, Postie MateTM thereby prevents dog bitten and/or lost fingers. Apart from being a professional musician, as detailed on this website, David Meacock was also a local councillor from 1999-2015. On 21 May 2014 he was bitten by a dog while delivering political leaflets. Having played Beethoven’s Third Piano Concerto two months earlier in St James’, Piccadilly, London his injury resulted in him being unable to play the piano for six months as a result of temporarily losing his entire RH index finger nail. He considered that he could not take the risk of the same or worse incident happening again in the future, yet he could not stop delivering leaflets to advertise his and his wife’s piano teaching and nor did he wish to have to cease his participation in politics by being unable to deliver leaflets as this is an important part of campaigning. After his accident, David researched to see whether there was already any device which would allow for easy safe delivery but only found one in common use which being small and very fiddly he dismissed as unworkable for mass deliveries. It would not facilitate the delivery of items undamaged through letterboxes fitted with one or two sets of draught excluder bristles. While sitting with his bitten hand above his head to hasten swelling reduction, David invented Postie MateTM. Delivering 15,000 leaflets with the two prototypes he made – one of which is pictured here, to show how it is used, either with one or two hands as the operator chooses - and a successful trial of Mini Postie MateTM with Parcelforce, gave David enough confidence to transfer the design to plastic to enable everyone to benefit from safe delivery of everything from leaflets to magazines, without the risk of life-changing injuries. In the meantime, having had a ruler snatched from her hand by a dog, (which due to a special design feature would not happen with Postie MateTM) Kate, David’s wife, has vowed never to deliver another leaflet again without Postie MateTM and so David and Kate hope for your own safety, you will now do the same. The risk of losing a finger as has been reported in the media just isn’t worth it. Be protected and as a bonus, make your deliveries more easily and quicker.